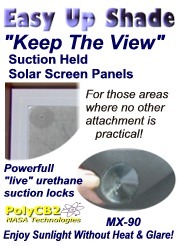 Hang-in-Place Solar Tarps for Designated Area Shade from bright sunlight. PTI Shade Screen Garden Cover Tarps Triple Plant Growth. Allow Longer Hours of Photosynthesis. Protect Gardens from Sun Scorching, Hail and Torrential Rain. PolyCB2 HD-60 solar shade screen mesh is woven and formulated to allow sufficient UV radiation from the sun to promote plant growth while protecting garden foliage from scorching and literally burning up. This increases the length of time throughout the day that maximum photosynthesis can occur. Young plantings grow faster and maintain strength. The slightly larger pores of the HD-60 provide increased air flow while controlling the amount of solar radiation. Cooler ground surface air rises and the hot air escapes upward through the shade screen mesh maintaining optimum temperature for plant growth while protecting your garden. 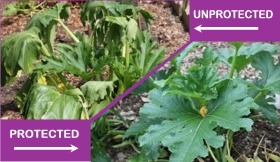 Picture depicts Zucchini plants exposed to Arizona sun with limited water. ProTect Garden Protection Shade Screen Mesh Tarps are available in custom sizes made according to your specifications. They can be simple rectangles or can be comprised of angles, curves, etc..
Edges are hemmed for superior strength. Standard spacing of the stainless steel grommets is 12" on the perimeter. Custom grommet placement is available upon request. PolyCB HD-60 is a heavy duty, yet light weight, solar shade screen material designed to withstand extreme environmental conditions and the rough treatment often associated with continuous usage in the agricultural industry and around home gardens. Retain flexibility and shape year after year. UV protected for long life and fade prevention. Will not mold or mildew. Will not become brittle with age and tear or puncture. Virtually indestructible. Impervious to hail stones, golf balls, wind blown debris. Up to 200 lb ball burst strength. You, The Customer with your ingenuity, imagination and requirements is what has made Protect Industries America's #1 manufacturer of custom screen mesh products. We thank you! And, will remain committed to listening. Ideal for Home / Office Windows, Skylights, Doors, Glass Block Windows, Arched Windows, etc.